Los Angeles will have a little more ink following the introduction of a new tattoo art installation at 3921 W Sunset Blvd. & Hyperion Ave. to kick off the Bulleit Frontier Works project. This is the first piece in a series of projects Bulleit will commission to celebrate and unite the thriving creative collaborator community in Los Angeles and beyond. The tattoo, which features Bulleit Frontier Whiskey’s iconic label alongside dozens of LA-inspired tattoo designs, was crafted by 24 tattoo artists who are locals of the Los Angeles area. The artists who contributed are people who have made a serious impact on the LA tattoo community, including Kim Saigh, Charles Belñavis, Henry Lewis, Shawn Barber and Jason Schroder. Each artist was given a section of the installation’s canvas to design and as a result every illustration carefully portrays Los Angeles in a way that is unique and personal to each artist. The tattooists selected to be part of this collaboration have collectively been in the industry for more than 100 years and have drawn thousands of tattoos that have adorned the people who roam the streets of Los Angeles and cross the globe. 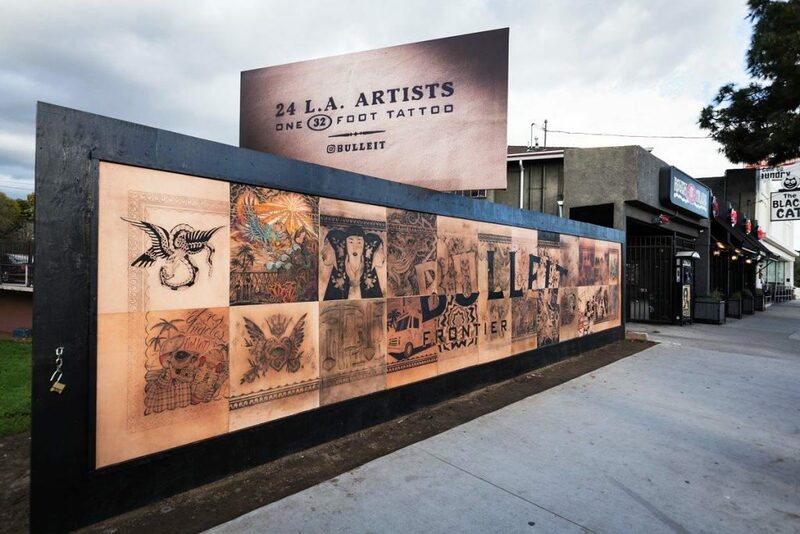 The Bulleit Frontier Works sign, located in the Silverlake neighborhood, is an incredible mix of design and artistic ability that took the tattooists more than 90 hours to design and create. Flanking Bulleit’s bourbon logo are more than 24 separate etchings that were inspired by the Los Angeles vibe including favorite local food trucks, views of the LA skyline, depictions of the beach scene and tributes to the Los Angeles movie industry. 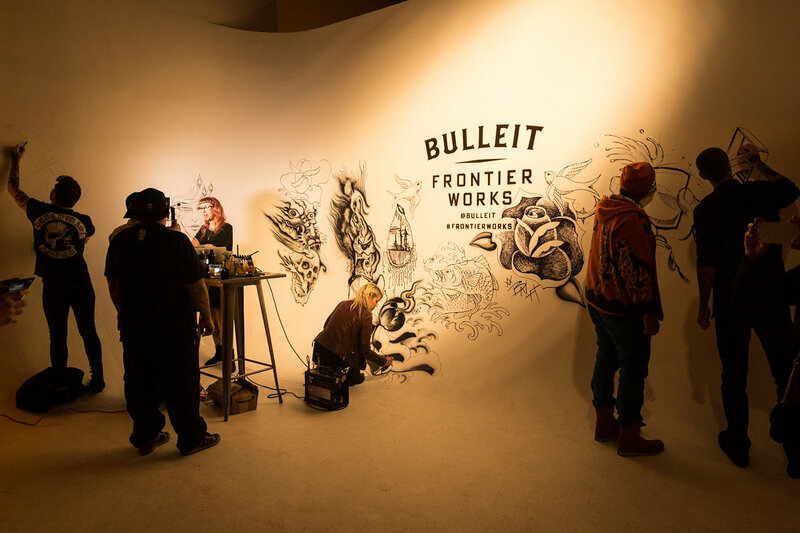 The Bulleit Frontier Works program will continue with another art installation in Los Angeles this spring before branching out to other cities around the country. The program aims to unite and celebrate the makers, artists and entrepreneurs who dedicate their lives to pushing the boundaries of the cultural frontier. Bulleit, a whiskey founded by Tom Bulleit who abandoned a successful law career to fulfill a lifelong dream of reviving his family’s century old high rye bourbon recipe, chose to launch in Los Angeles based on the relations made with bartenders, partners and friends who’ve embraced the whiskey so much that LA is now Bulleit’s bestselling market. To celebrate the installation, Bulleit will host the artists, press and members of the community at a private event thanking them for their support and appreciation of the tattoo industry. The event will allow guests to enjoy delicious Bulleit Bourbon and Bulleit Rye cocktails responsibly – a message also featured prominently on the sign.